Now that we’ve entered the cooling season, homeowners throughout the area are thinking about how well their ACs will work this season. If you never had that strange sound looked at from the end of last summer, or if you’re concerned that it needs professional attention, now is the time to get in touch with your local AC professional. When problems are neglected, they tend only to worsen. In this post, we’d like to examine a few common air conditioning repair problems, so that you can recognize the need for pro assistance when you see them. Call Larry & Sons today! Not enough cooling: This is a common symptom that has numerous possible causes. There’s no quite telling what the root cause of it is without professional inspection. One common cause is an airflow issue, often caused by a clogged air filter. Remember to make sure your air filter is clean of debris about once a month during the cooling season. While it is intended to prevent the accumulation of dust and debris on your system components, when it gets clogged or becomes dirty, it can actually impede airflow and block the cool air that you need to stay comfortable. Dirty coils: When your condenser coils get dirty, which can happen frequently because they are housed in the outdoor unit, it won’t be able to dissipate heat into the outside air. If this process is disrupted, the cycle will not be as efficient, and it may result in warmer air coming out of your ducts. 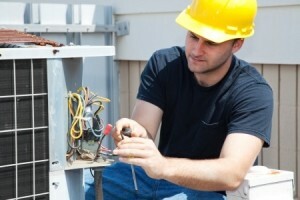 A technician can ensure that all aspects of your AC are clean so that you can avoid any further disruptions. Low refrigerant: When it was installed, your AC was “charged” with a set amount of refrigerant. Over time, however, you may have developed a leak in one of the coils, or the lineset that has resulted in low levels of refrigerant circulating through your system. This causes a wide variety of problems, including inadequate cooling and a lack of dehumidification. Make sure you’re ready to go this summer. Call Larry & Sons for comprehensive air conditioning repair services in Frederick, MD if you’re concerned about your AC.